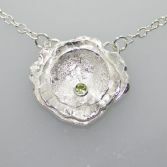 This solid sterling silver necklace was created for a customer who wanted a chunkier version of my Petal necklace. 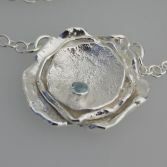 I can make a similar version of this necklace to order, however it would not be exactly the same as the pictures (but quite similar) To make the layered petals i have to melt sheets silver to achieve each petals ruffled edges so no one petal is the same. 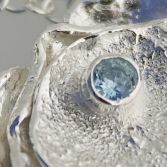 I then solder the 3 petals together before setting the 3.5 mm semi precious gemstone shown here with a Peridot and Sky Blue Topaz. If you wish to order one of these necklaces but with a different gemstone then please use the drop down option below to select your gemstone. The necklace is made with a strong sterling silverTrace chain as shown in the image, each link measures 3.0mm by 2mm and with a strong sterling silver lobster clasp and extension loops to adjust length by up to 1 inch if required. The necklace can be made with various chain lengths, 16inch, 18inch or 20inch please use drop down below to select. 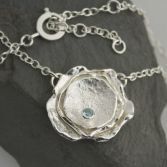 Or if you have a special requirement for the chain or any questions please email me julie@juliebrandonjewellery.co.uk. 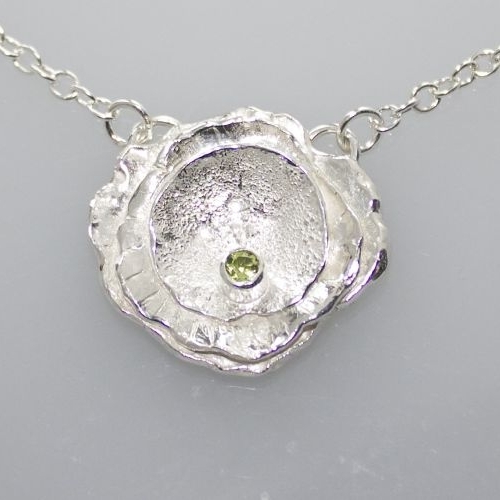 Please note that this necklace is made to order and once completed is required by law to have full UK hallmarks due to its weight, and so is sent to a UK Assay office for hallmarking. This process can take up to 7days or more, so please do allow 2-3 weeks from date of ordering for your necklace to arrive. Earlier delivery times may be achieved but just to be on the safe side allow 2-3 weeks. Petal Gemstone: Golden CitrineGreen PeridotLemon QuartzLight AmethystPink Rhodolite GarnetSky Blue TopazWhite TopazWould Like Different Stone Email Me.